American popular music in the early 20th century was centered in New York City, specifically in an area known as "Tin Pan Alley." Tin Pan Alley initially referred to a precise location: 28th Street between 5th and 6th Avenues. However, as the popular music industry blossomed and attracted more and more songwriters and publishers, the name shifted to refer to these New York City songwriters and music publishers, rather than the original location. The musicals on Broadway, a popular venue for American music in the early 1900s, often pulled from the songs written in Tin Pan Alley, which helped increase the popularity of Tin Pan Alley composers. Some of the most popular of these composers are Irving Berlin, George and Ira Gershwin, Scott Joplin, and Harry and Albert Von Tilzer. Notable publishers from Tin Pan Alley include Leo Feist; M. Whitmark & Sons; Waterson, Berlin & Snyder, Inc.; and Shapiro, Bernstein & Co. Most of the sheet music in this section was published in New York City, some under predominant Tin Pan Alley publishers like Leo Feist and Shapiro, Bernstein & Co.
World War I music, much like other cultural creations such as books and TV shows, is an illuminating product of its time, providing insight into the various popular sentiments prevailing in America during the war. These sentiments and themes include antiwar feelings, reluctance, loss, patriotism, inspiration, and dedication to the war effort. The role of women in the sheet music is varied. Some of the pieces feature a female songwriter and/or vocalist. However, many of the pieces feature women on the covers, showing them either as passive or active agents in the war. Pieces in which women seem passive and helpless tend to be more sentimental and show women being left behind or reluctantly saying goodbye as the men go off to war (see, for example, "I Didn't Raise My Boy to Be a Soldier"). Then there are the songs where women are depicted as taking an active role in aiding the war effort, such as "I'm Going to Follow the Boys" and "(And Then She'd) Knit, Knit, Knit." In addition to showing women in active and passive roles during the war, the songs highlight circumstances in which many women found themselves, whether it was having a father, son, or husband go off to war or taking part in the home front war efforts. "Popular Songs of World War I," University of California, Santa Barbara Library. Sources on Popular World War I Songs, compiled by the University of California, Santa Barbara Library. "The Voices and Music of World War I," University of Missouri-Kansas City University Libraries. 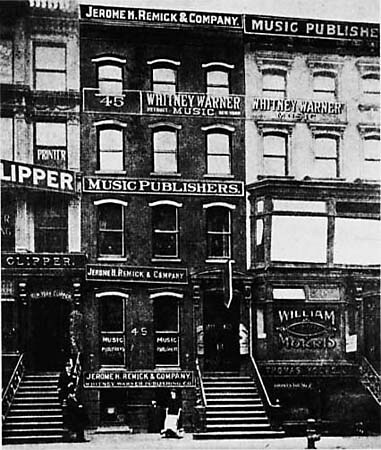 "Buildings of Tin Pan Alley, 1910," Wikimedia Commons, JPEG file, http://upload.wikimedia.org/wikipedia/commons/c/c8/Tinpanalley.jpg (accessed April 30, 2015). This sheet music is for the song “The Star of Glory” that was written and composed by Emmett J. Welch. The sheet music was published by Emmett J. Welch Music Publisher of Philadelphia, Pennsylvania in 1918. The cover features an image of a mother and child praying for their husband and father who is fighting in World War I. The Star of Glory is the star hanging in the window, symbolizing that there is someone from that house fighting “over there.”The back ground of the cover has an illustration of soldiers trenches by “going over the top” of their trenches and charging into no man’s land. This sheet music is for the song “The Rose of No Man's Land.” The lyrics were written by Jack Caddigan and the music was composed by James A. Brennan. The sheet music was published by Leo Feist, Inc. of New York City in 1918. The red cover features an illustration of a nurse in No Man’s Land looking heavenward into a ray of light. The song was written as a tribute to Red Cross nurses serving in World War One, and this is the Patriotic War Edition that was printed on smaller paper to help the war effort. Cover illustration: reproduction of a photograph of a soldier (played by Vitagraph star Empey?) with rifle. R.A.F. Hawker Hurricanes and stylized Russian airplanes attack Luftwaffe Junkers JU-87s (Stukas).